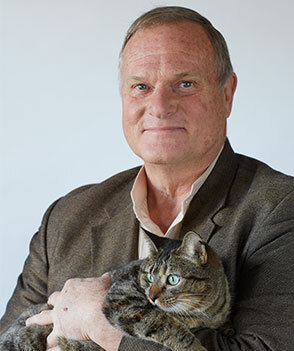 People from all parts of the Greater Birmingham area bring their beloved animals to Forestdale Veterinary Clinic and Dr. William E. DeWitt Birmingham’s Family Veterinarian. Come for a visit and find out why. Conveniently located on Highway 78 West, less than 15 minutes from downtown Birmingham, Forestdale Veterinary Clinic provides a full range of veterinary services to treat sick or injured dogs and cats and occasionally other critters as well as preventive care, routine exams, specialty pet food, and supplies to help you maintain the health and well-being of your pets. visit us at 1320 Forestdale Blvd. You always see familiar, friendly faces at Forestdale Veterinary Clinic. A graduate of Auburn University’s School of Veterinary Medicine, Dr. DeWitt is a local and national leader in the veterinary profession. 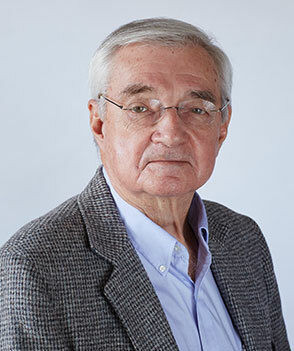 Former president of the Alabama Veterinary Medical Association and member of the Alabama VMA’s executive board since 1988, Dr. DeWitt has served as Delegate to the American Veterinary Medical Association’s House of Delegates since 2002. 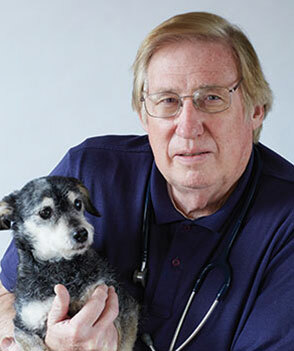 Dr. DeWitt has received numerous honors, including Alabama Veterinarian of the Year in 1999-2000 and the 2010 Distinguished Service Award from the Alabama Veterinary Medical Association. Dr. Chandler McGee is a 1964 graduate of Auburn University. He does general practice and relief work. Pets teach us to to enjoy the simple things. As a family-owned practice, Forestdale Veterinary Clinic’s dedicated professionals know you and your animals personally, and we guide you through every stage of their growth and development. With its skilled and experienced staff, Forestdale Veterinary Clinic of Birmingham has served our community and its beloved pets for more than 40 years. 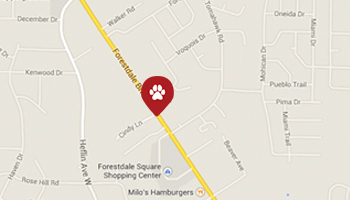 Come join the family at Forestdale Veterinary Clinic. We also offer comprehensive diagnostic and treatment services comparable to much larger animal hospitals. Most radiology (X-ray), ultrasound, and laboratory diagnostic services are conducted on-site eliminating long wait times for results. We perform a wide range of veterinary surgical services and maintain a state-of-the-art laser surgery facility. Forestdale Veterinary Clinic also provides affordable nutrition and pet care products including specialty foods, heartworm preventative, flea control, and more. Our clinic’s routine vaccinations and preventative care will give your pet a healthy start to a long, happy life! Routine vaccination provides necessary protection against a variety of viruses and bacteria that can cause serious illness and health consequences. Equally important is parasitic prevention, which keeps your loved-ones safe from a variety of parasites, including heartworms, fleas, ticks and intestinal parasites.Animals age 5 to 7 years for every one of ours. Because they age more rapidly, semi annual exams are very important. Forestdale Veterinary Clinic’s team is fully trained to utilize every aspect of our in house technology leading to a faster diagnosis, and allowing us to treat your pet immediately for their aliment. Our capabilities include, but are not limited to chemistries, electolytes, CBC, urinanlysis, cytology and fecals. Forestdale Veterinary Clinic’s doctors carry the appropriate accreditation and licensing to provide your animal with a USDA sanctioned examination, allowing you to travel interstate or abroad with your loved one. In the event your pet requires urgent care, our professional staff will provide immediate and compassionate treatment in their time of need. Our hospital is equipped with the latest in-house laboratory technology for on-site diagnostics. Dentistry is an important part of your pets overall health. Forestdale Veterinary Clinic offers a variety of dental services, from routine prophylaxis cleaning to oral surgery. We promise to provide your pet with a comfortable, clean and healthy smile. Our team of experienced medical staff is specially trained to safely anesthetize, monitor and recover all surgical patients. In addition to spay/neuter and declaw procedures, we offer extensive soft tissue procedures, such as cystotomies, splenectomies, exploratories, foreign bodies, mass removals, and other surgical operations. Forestdale offers laser surgery which can be used to treat a variety of acute and chronic issues in a noninvasive manner. Digital Radiology is available on-site for the immediate diagnosis of trauma, foreign bodies, fractured bones, tissue health and organs. Once radiographs are taken, our skilled veterinarians interpret the findings and send images to a boarded radiologist for a second opinion. Forestdale Veterinary Clinic has digital radiology available on site. Radiographs are recommended for a variety of reasons allowing our doctors to see organs and bones in an interactive format. We also have 24/7 access to a boarded radiologist to review your pet’s films allowing us to provide the highest level of diagnosis in minutes. Our practice offers a non-invasive imaging technique by utilizing ultrasound exams that allows internal organs to be seen by recording echoes or reflections of ultrasonic waves. This is a safer technique compared to x-rays. Endoscopy is a general name for a range of procedures (including bronchoscopy, colonoscopy, cystoscopy, gastroduodenoscopy, and rhinoscopy) in which an endoscope is used to look inside and perform actions inside of animals. Endoscopy not only allows visualization of certain organs, but also allows sampling of tissues (biopsy) for cytological, histologic, culture evaluation, as well as possible foreign body retrieval when necessary. Fill out the form below to request an appointment at our clinic! *Appointment requests are not guaranteed. Please wait until you have received confirmation from us.